I got to the mansion late, and upon seeing a greater-than-usual turnout, I was lucky to find a spot that I liked. This doorway framed the staircase nicely, and provided an interesting perspective with many pockets of light and dark, which I tried to capture. The second sketch at right was looking from the opposite corner, just in front of the door you see in the first sketch at left. The tricky perspective was a challenge, and took me awhile to set up! 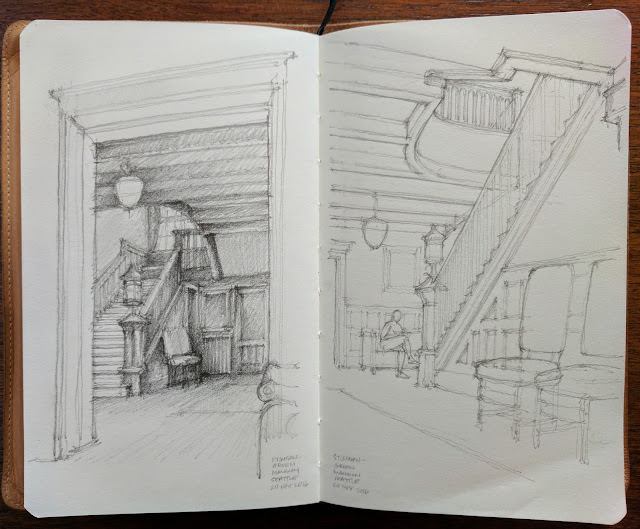 It's not every day you get to sketch an interesting space such as this. Looked at it again. The perspective looks really hard. You did got it spot on. How long did it take?